Samantha Custer, Zachary Rice, Takaaki Masaki, Rebecca Latourell and Bradley Parks. 2015. 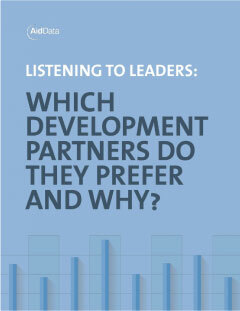 Listening to Leaders: Which Development Partners Do They Prefer and Why? Williamsburg, VA: AidData at William & Mary. This publication showcases where 53 bilateral and multilateral development partners send their development finance and how they are perceived by in-country stakeholders. Dynamic versions and individual PDFs of each profile are available on the Development Partner and Host Country Profile homepage. A collection of 111 Host Country Profiles is also available. 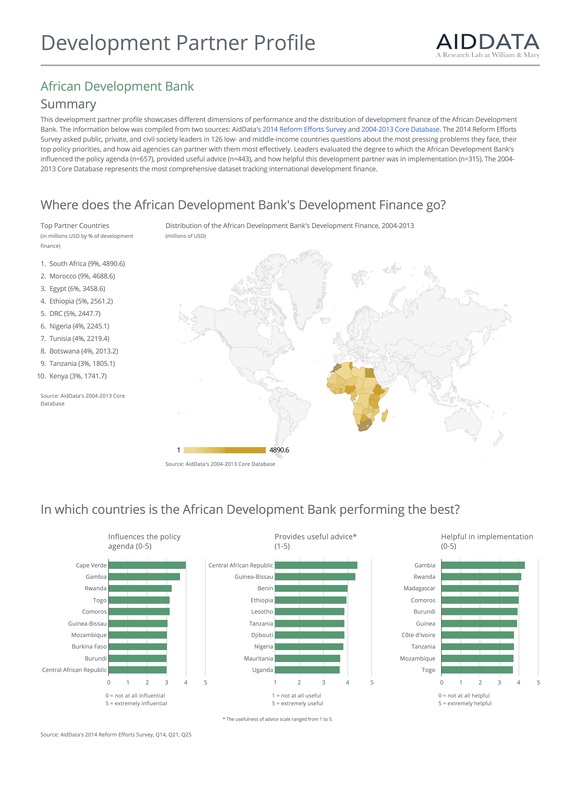 These 2-page development partner profiles draw from two complementary sources: AidData's 2014 Reform Efforts Survey and AidData's 2004-2013 Core Database (Research Release 3.1). The 2014 Reform Efforts Survey asked public, private, and civil society leaders in 126 low- and middle-income countries questions about the most pressing problems they face, their top policy priorities, and how aid agencies can partner with them most effectively. Leaders evaluated the degree to which different development partners influenced the policy agenda, provided useful advice, and how helpful each development partner was in implementation. The 2004-2013 Core Database (Research Release 3.1) represents the most comprehensive dataset tracking international development finance. Funding: The John Templeton Foundation and the Smith Richardson Foundation provided generous support for the production of these profiles.